From April to September Valérie, Charlotte and Gloria welcome you warmly at the reception. We speak French, English, Dutch and German. As you drive along the Normandy coast with its pink granite rocks and beautiful waves, you suddenly discover L’Anse du Brick nestled against the hills. In this context of greenery where heather and broom bloom, the forest runs to the sea to the delight of the campers. Use Bretteville-en-Saire instead of Maupertus-sur-Mer as your destination. Drive through the village Bretteville and keep the sea on your left until you reach L’Anse du Brick (4 km). 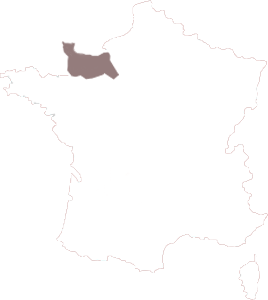 The campsite is located 10 km east of Cherbourg along the sea towards Tourlaville, then Bretteville and Saire and finally Fermanville on the D 116. Breath the sea air, that’s it, you’re on vacation! During your visit to the department of Manche, go to Val de Saire. Walk along the little harbors full of flowers, climb the 365 steps of the lighthouse of Gatteville to look 360 degrees around the Normandy coast. Admire the paintings of watercolor painters and taste the oysters of Barfleur. Our campsite is near the beach of L’Anse du Brick and welcomes you warmly, we offer you the maximum comfort during your stay by the sea. L’Anse du Brick sits against the rocks, in an area of 300 HA of green landscapes and forest, between Barfleur and Cherbourg, the ideal vacation spot for lovers of nature. Located 10 minutes east of Cherbourg, Castel Camping L’Anse du Brick offers a magnificent view of the sea, beech forest and heathland. Normandie offers a lot to its visitors, who want fresh sea air and want to discover the region. Relive the liberation of June 6, 1944 on the landing beaches, visit the classified monuments such as the Mont Saint Michel or the tapestry of Bayeux and take full advantage of this Norman coastal strip with various water sports nearby: sailing, sand yachting, kayak, rowing …. To learn more about the principles of Mailchimp's confidentiality policy, click here.